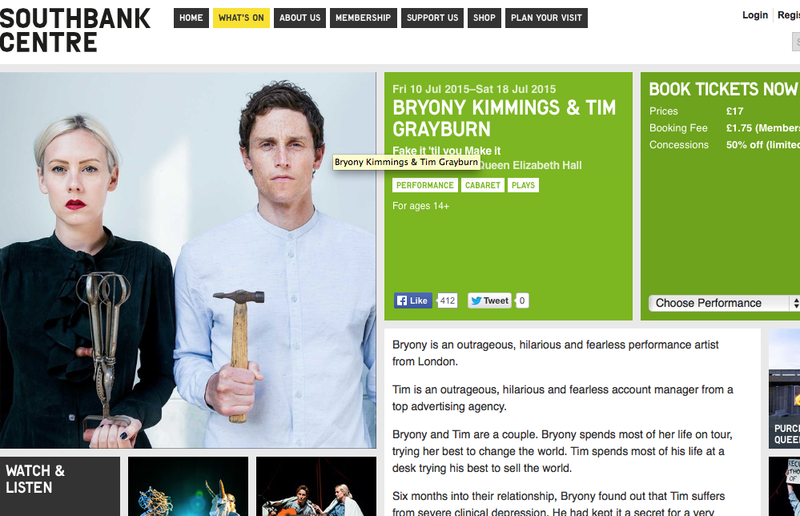 Jenny Doe reviews a play from Bryony Kimmings and Tim Grayburn. Tim and Bryony met and fell in love. This piece, a true story, simply and beautifully tells of the intruder in the living room in Bryony and Tim’s new relationship – the crippling clinical depression that had partnered Tim for eight years before he was able to speak to anyone about it. The story is told through a variety of parallel channels, songs, movement, narratives and intercut with excerpts from recorded interviews with Tim, speaking frankly about his experiences. Thoroughly researched and very informative, whilst still being utterly gripping throughout, this show is a genuine attempt to unblock the taboos on talking about depression. Whether it is a condition that you know about personally, professionally, or not at all yet, Fake It is a striking, perfectly balanced, and life affirming piece of theatre, profound and funny, with a strong message that is interwoven through the dramaturgy so as never to overwhelm it. The Clinical Depression Mambo gave us a checklist of the more unusual symptoms expressed through the medium of dance, and such lighter moments dealing with heavy material perfectly balanced out the more distressing elements of the story. Tim’s own face was never revealed until the end of the performance, being masked by an inspired variety of symbolic headgear – from binoculars, clouds, and a minotaur’s head perfectly representing the beastliness of suicidality. The most powerful element for me, at the centre of the piece, was a mime to the jaunty background music of the Carpenter’s “Why do birds suddenly appear...” in which Bryony’s puppyish and optimistic attempts to get a reaction from an unresponsive Tim, paper bag over his head, failed repeatedly, and painfully illustrated the desperate unreachableness of someone with depression. A powerful message was delivered, about how the stigma of mental illness prevents sufferers from letting anyone in on the dark dirty secret of being depressed and suicidal, and how the myth of needing to be a 'real man' further complicates the possibility of disclosure or help-seeking. But what seemed to be missing here is a link between these phenomena and the actual provenance of mental health problems in the first place. Whilst SSRI antidepressant medication is rightly critiqued for its ghastly catalogue of potential side effects, there is no exploration of talking therapies as a possible way of formulating and understanding Tim’s depression. And the implied notion that sharing the diagnosis, and the love of an amazing girlfriend, might be enough to help manage Tim’s condition, left me wanting another chapter. The final song, The Duvet Song, delivered touchingly by Tim, tentatively accompanying himself on guitar, ended the show leaving many in the audience weeping, but in a good way. - Reviewed by Jenny Doe who is a Clinical Psychologist with the NHS in Luton.